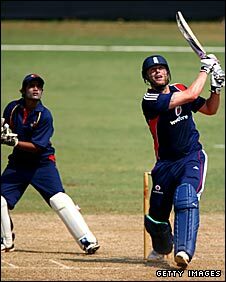 Andrew Flintoff struck an unbeaten 100 as England beat the Mumbai Cricket Association by 122 runs in the first warm-up match of their tour of India. Flintoff's first English hundred since the fourth Test of the 2005 Ashes came from 85 balls and contained three sixes and 12 fours, but he was dropped twice. He helped the tourists add 112 in the final 12 overs of this 12-a-side match as England made an impressive 297-4. 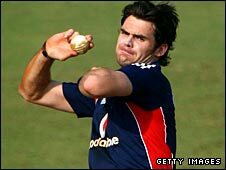 England used eight different bowlers and James Anderson took three wickets. There was no toss in this unusual fixture, in which scorers for media outlets were not permitted. It was agreed that England would bat first, and they might have lost Matt Prior without scoring in the second over. The wicketkeeper got an inside edge to seamer Prashant Bhoir, but Mumbai CA wicketkeeper Sufiyan Shaikh could not snare the chance and it raced away for four. Prior pulled a more conventional boundary through mid-wicket but soon lost his middle-stump, before Ian Bell and Owais Shah overcame a hesitant start and shared 78. Bell was stumped for 58 after charging down the pitch to off-spinner Vikrant Yelgeti. Kevin Pietersen also fell to spin, caught behind for six off slow left-armer Nilesh Kulkarni, but Shah made a run-a-ball 83 before mis-timing to mid-wicket with five overs remaining. Flintoff took advantage of reprieves on seven and 25, reaching three figures in the final over with a six. One of his powerfully hit strokes caught Vinit Sinha on the shoulder and ended his part in the proceedings. Flintoff then took an early catch at second slip as Anderson enhanced his claims for a place in Friday's opening one-day international, having been left out of the team for the ill-fated Stanford Super Series finale. Spinner Samit Patel struck twice and Flintoff's ever-reliable bowling saw him also in the wickets column in the closing stages. "We'll play against better teams on this tour, obviously, but a hundred is a hundred and I've not scored one for ages so I'll take it," Flintoff said. "I enjoyed it because I feel comfortable about the way I'm playing. One of the things about my batting is that it does take a while. I've not played for a while and I'm finding my rhythm but I'm getting there. "I'm not daft, though, and I know it's a starting point. We're going to be playing against the likes of Harbhajan (Singh) and (Ishant) Sharma in just over a week's time - this was fine but it's not always going to be like that."